Windows 10 here, Windows 10 there, and it is everywhere. This is exactly what Microsoft dreamed of, and it seems like the company is actively working to reach its One Billion goal by the end of 2017 or mid-2018. Proudly announcing its first huge success, Microsoft reported that its newest Windows 10 operating system is now officially installed on more than 200 Million devices worldwide since its launch five months ago. Windows 10 is the latest as well as the greatest operating system from Microsoft that took less than six months to hit 200 Million milestone. 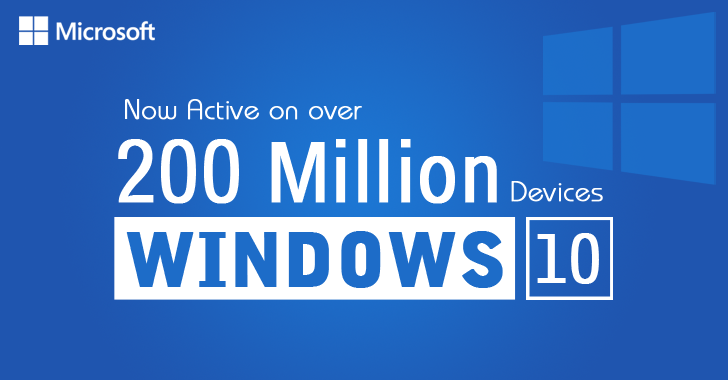 Over 11 Billion hours have been spent using Windows 10 in December, meaning roughly 365 million hours per day. Must Read: Here's How to Stop Windows 7 or 8 from Downloading Windows 10 Automatically. What made Windows 10 an enormous success? Obviously, the first and foremost reason to reach these milestones is the fact that Windows 10 was available as a free upgrade for both Windows 7 as well as Windows 8.1 users during its first year. In addition to the free upgrade, Microsoft also changed the whole game by including non-PC devices such as smartphones (Windows 10 Mobile) and other smart devices in its count. As Windows 10 is now on the Xbox One, new Lumia phones and even on some IoT devices. Also Read: Reminder! If You Haven't yet, Turn Off Windows 10 Keylogger Now. Microsoft says it was 'humbled' by the update, but still it aims to have Windows 10 running on 1 Billion devices by late summer 2018, including computers, smartphones, consoles, and Internet of Things devices, as well. As part of its strategy to reach this milestone, all Microsoft has to do is contributing to the massive Windows 10 push. Microsoft will very soon begin automatically upgrading some users to the newest version of its Windows OS, the company revealed. Must Read: Microsoft Offers — 'Upgrade now' or 'Upgrade Tonight' to Push Windows 10. The company plans to re-categorize Windows 10 as a "Recommended Update" in its Windows Update service in the early part of this year, in an effort to begin automatically downloading and installing Windows 10 to Windows 7 and 8 users. It doesn't come as a surprise as Microsoft previously tried several number of times to push its new operating system more aggressively. Windows 7 and 8.1 users have been forced many times to upgrade their machines to Windows 10. After all 200 Million-device milestone is a big one, but if compared to the company's 1 Billion goal, Microsoft has just hit 20% of its milestone. Although there is nothing we could predict what tweaks Microsoft has planned for future upgrades, the next time you may get a pop-up window with a single button that says "Upgrade Now." Also Read: Just Like Windows 10, Windows 7 and 8 Also Spy on You – Here's How to Stop Them.